The boat was built in 1958, the first certificate issued in 1959. After an enourmous effort and not countable hours of restoration, "Bellatrix" could be seen again on Rostock waters, during the last weekend. 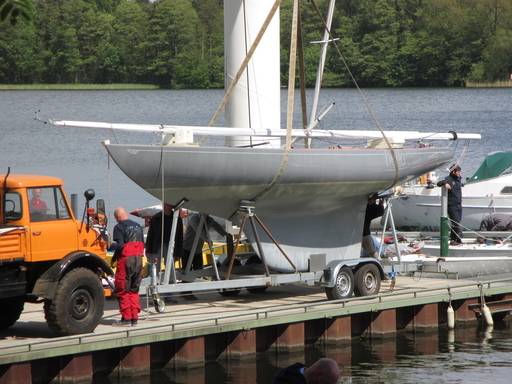 She will be joining GER 59 for local racing and is expected in Northern German 5.5m regatta events as well. After spending several years as a "full-cabin-option" cruiser, the boat is in new hands now and is planned to be fully restored, back to original racing condition, thus enlarging the Rostock based 5.5m fleet.